Unemployment and income inequality are issues that are plaguing both countries; so, policies to ameliorate rather than exacerbate them need to be considered. Further research need to be conducted to understand the impact of the TPP on Canada and the U.S. before the trade agreement goes into effect. The Trans-Pacific Partnership (TPP) is a trade agreement between Canada, the U.S. and 10 Pacific Rim countries. These 12 countries have a combined gross domestic product (GDP) of US$28.5 trillion. The deal will lead to the elimination or reduction of tariff and non-tariff barriers on the trade, investment of goods and services while enforcing intellectual property rights. The effect of the TPP on Canada and the United States has been considered and analyzed, and different conclusions have been drawn. 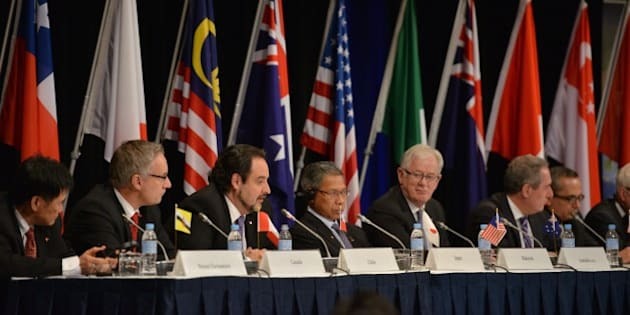 Some research has concluded that the TPP would be beneficial for both the countries, while others have argued that the benefits would be more nuanced. Again, others have concluded that the TPP would be harmful for both the countries in terms of lower GDP, employment and worsening income inequality. According to the World Bank, the TPP would be beneficial for member countries. It would increase their exports by 11 per cent and boost their GDP by an average of 1.1 per cent by 2030. Both Canada and the U.S. are predicted to see increases in exports and GDP with the implementation of the TPP; however, their gains would be less than smaller TPP members, according to the World Bank. Research by Petri, Plummer and Zhai (2016) states that the TPP would be beneficial for both Canada and the U.S. Their working paper states that the United States would be the largest beneficiary of the TPP in absolute terms. It states that Canada's exports would increase by U.S. $58 billion or 7.0 per cent while its GDP would increase by US $37 billion, which is 1.3 per cent of GDP, by 2030. Again, U.S. exports would increase by US$357 billion, or 9.1 per cent, while its GDP is predicted to increase by US$131 billion, or 0.5 percent of GDP, by 2030. Also, the paper reveals that wages would slightly increase in the U.S. with movement of workers between industries due to structural changes. Therefore, exports and GDP of both countries are expected to increase while wages are predicted to slightly increase, and there would be movement of workers between industries. David Autor, David Dorn and Gordon H. Hanson (2015) also state that the TPP would be beneficial for the United States. They state that TPP encompasses intellectual property and foreign investment, which would increase trade in knowledge-intensive services, a sector in which U.S. companies are very strong. Also, they mention that enacting the TPP would raise regulatory rules and standards for several of China's key trading partners. According to the article in the Washington Post, this would pressure China to meet some of these standards and reduce its attempts to manipulate global trade. However, other research has found that the TPP would not be that beneficial for Canada and the U.S. According to Economic Policy Institute (2015), the TPP would not be that beneficial for U.S. workers. Their research reveals that a trade deal with trade partners who are poorer and are labour-abundant would lower the wages of most American workers. Also, there would be reshuffling of production and workers from labour-intensive import-competing sectors to capital-intensive export sectors as the U.S. has a comparative advantage in the future. This would dampen wages in the U.S., leading to higher income inequality. Research conducted by Capaldo and Izurieta (2016) find that the TPP would not be beneficial for Canada and the United States. In their paper, they allow for changes in employment and income distribution. They find that the TPP would lead to lower GDP for the U.S. and a slight increase for Canada. It is predicted that U.S.'s GDP would decrease by 0.54 per cent while Canada's would slightly increase by 0.28 per cent by 2025. The paper forecasts that the total GDP of the developed economies in the TPP would decrease by 0.34 per cent by 2025. However, net exports of the U.S. is expected to slightly increase (0.20 per cent), and Canada's to slightly decrease (0.58 per cent) in the same time period. While changes in GDP and net exports are marginal, the TPP is predicted to lead to employment loss. Canada is expected to lose 58,000 jobs while the U.S. is forecasted to lose 448,000 jobs. Overall, TPP countries are expected to lose 771,000 jobs while non-TPP countries are predicted to lose even higher number of jobs (5.33 million) due to a global race to the bottom. The movement of production to capital-intensive, export-oriented sectors would lead to decrease in employment and downward pressure on wages. Labour's share of national income would decrease according to the paper; this would lower consumers' purchasing power and lead to higher income inequality. One benefit of enacting the TPP would be increased use of intellectual property rights if the rules and regulations are followed by all member countries. However, there is no provision in the TPP to limit or eliminate currency manipulation by member countries. The introduction of a clause to stop currency manipulation by member countries would be an important positive addition to the TPP agreement. According to research by Capaldo and Izurieta (2016), the TPP would not bring much benefit in terms of net exports and GDP to either Canada or the U.S. However, it would lead to loss of employment in both countries as well as higher income inequality due to labour's reduced income share.